During the season of fall feasts that just ended, I believe we witnessed nothing less than Kingdom-shifting breakthroughs for the sake of world evangelization. It would not be inaccurate to say that a fresh wave of revival was released from Israel. The breakthrough and release are significant but subtle. Therefore, we hope you’ll be encouraged to pray with us into what God is doing.As you read let your faith be renewed, as is ours. We believe that as Israel is blessed, so are the nations, giving us much reason to rejoice. For the sake of brevity, we will list just five of the many shifts that took place in the Land over the past few weeks. We’re including only those events to which we personally bore witness. These shifts may seem small, but we agree with other Israeli leaders that they represent genuinely new beginnings in Israel. 1. At the Yom Teruah (Rosh Hashanah) gathering we facilitated at a house of worship, we saw the Holy Spirit’s fresh fire fall on Hebraic, biblical expressions of faith as never before. An eclectic, combined local and international gathering quickly morphed into a unified military operation in the spirit realm. Powerful scripture decrees were released overlooking the Temple Mount as shofars blasted in a manner only the Commander of Heaven’s Armies could inspire. We watched a remnant of one new man suddenly function under Holy Spirit leadership as a remnant Messianic warrior bride. It was electrifying. 2. At two different Christian sponsored events, we were introduced to Israeli politicians who have historically strongly opposed Messianic Jewish believers. (These same leaders are often sincere friends of Gentile Christians.) As I (Sandy) met each one I assumed – and hoped – that my last name and overtly “Jewish” manner of expression would reveal my Jewishness. Not only did these politicians interact warmly with me, but one even expressed admiration for the fruit of my faith in Yeshua. We feel these interactions reflect and signal change at key levels of Israeli society toward Jews who believe in Jesus. We saw some of these same leaders at another, very friendly meeting a week later. Clearly and more more (but not all) Israelis understand that some evangelical Christians are their best friends. As some Christian leaders begin to courageously stand with and support Messianic Jews, gates are opened in Israel to welcome Jesus the Jew. 3. At an international conference where Sandy spoke on prophetic prayer for Israel, we witnessed an outpouring of the Holy Spirit like we’ve personally never seen while speaking on this topic. The whole conference launched into fiery intercession for Israel as one new humanity at a supernatural level. 4. Perhaps the most significant, nation-wide breakthrough took place at a conference last week called Welcoming the King of Glory. The conference was initiated by mostly Christian indigenous tribal leaders from remote Pacific Islands, such as New Caledonia, Solomon Islands and others. In Scripture, nations from the far ends of the earth are those located farthest from Israel, which today would include these same Pacific Islanders. Most who came were quite poor by the world’s standards. For some, going to Jerusalem for the Feast of Tabernacles was the pilgrimage of a lifetime. Yet they gave us Israelis a gift far more valuable than we could have imagined. These hundreds of humble believers felt they could not properly honor the Lord, in His Land at His holy feast, without properly honoring the indigenous Israeli believers. They understand spiritual protocol. They believe ultimate spiritual authority in any nation rests with the indigenous body of Messiah of that nation. (By God’s grace, Kerry and I had both been invited into the indigenous Israeli leadership.) The islanders told us they would not come to Israel unless the local believers led them in, both physically and spiritually. This included the unfolding of their entire conference. To our collective knowledge, this type of spiritual protocol had never happened here on a national level – and the results could be life changing. The extraordinary humility with which the Islanders came proved irresistibly contagious. Several indigenous Israeli Messianic Jewish leaders said this was the first time a significant remnant of them, from unrelated ministries, had cooperated at such genuine depths of unity. Indeed, the occasion called for much cooperation, practically moment by moment. But where slick showmanship or professional polish was lacking, raw servanthood and pure sincerity opened gates from heaven. God did exceedingly beyond our expectations. In this atmosphere of humility, healing and proper spiritual alignment fell into place. Love was released among the brethren at a whole, new depth. One immediate result is that Messianic women were given place to speak publicly. At one point the leadership deviated from the program so a woman could share from the platform what the Lord had spoken to her prophetically about the gathering. (This is not the norm, and possibly even unprecedented in such a forum.) Other female input, involving more, on the spot program changes, was likewise received. 5. Earlier this week we were honored to pray over a former American congressperson who is launching a new ministry at the United Nations. This internationally well-known person, a staunch Christian supporter of Israel, wanted to align with the government of God from Jerusalem through local, apostolic prayer before ministering in and to the UN. As you know, the UN is currently not aligned with God’s government. YHVH, however, wants to give even these world leaders opportunity to turn to Him. Please pray for our friend’s new ministry! We regard the above, five signposts of change in Israel’s spiritual climate as major answers to prayer! We also sense that as Israel approaches her 70th birthday in May 2018, her physical restoration to the Land is nearing a cycle of completion. (Completion does not mean fulfillment; at least six million Jews still live outside Israel.) After 70 years of restoration to the Land, however, it seems Israel’s spiritual restoration to the Lord could be at hand. 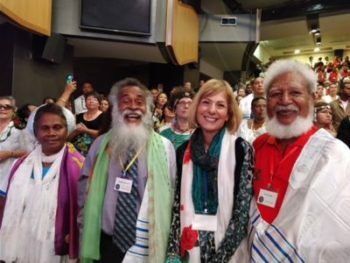 During the feasts, progress continued toward the establishment of a local, indigenous Israeli intercessory prayer network. Also, I (Sandy) was invited to participate in a respected, prophetic round table in the US in November. For the first time, the round table is open to a limited number of international leaders. I’m deeply honored to represent Israel, along with two “Ruths.” And lastly, on the theme of outreach to Israelis, Kerry is resuming the home visitation ministry now that the busy holiday season is over. Would you please pray for these three events to transpire in the Spirit and bear much fruit? During all the wonderful feast celebrations, Israel’s enemies took no rest. We now face increasingly serious threats from Iran, Hezbollah, the new Hamas-Fatah accord (however long it lasts), Syria, ISIS nearing our borders, and North Korea. Due to former President Obama’s lackluster tenure, Russia is the new sheriff in town, so to speak. President Putin is regarded as the power broker now in the Middle East. Russia backs Iran and other anti-Israel forces. At this time, Israel’s relationship with Putin is actually reasonably good, but the prophetic Scriptures give us reason to proceed with caution concerning Russia. In addition to the mounting threat of war, it is critical to pray for God to direct Israeli PM Netanyahu to raise up a successor. Netanyahu is a strong leader who has steered the country quite well, overall. We pray he remains in office for as long as God desires. But he cannot serve forever. It is time for him to earnestly begin to prepare the man or woman of God’s choice to lead Israel into her new season. (Ecclesiastes 3:1-8) Thank you for praying for Israel and for us!